We love stories and poems. 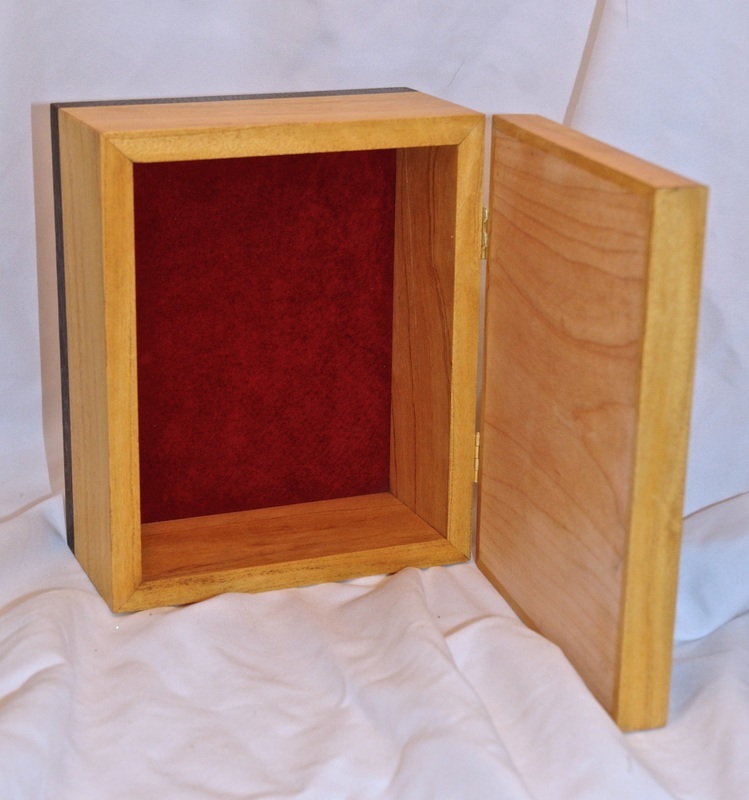 These boxes tell stories- or relate short parts of poems- in two images: the top and the inside base. 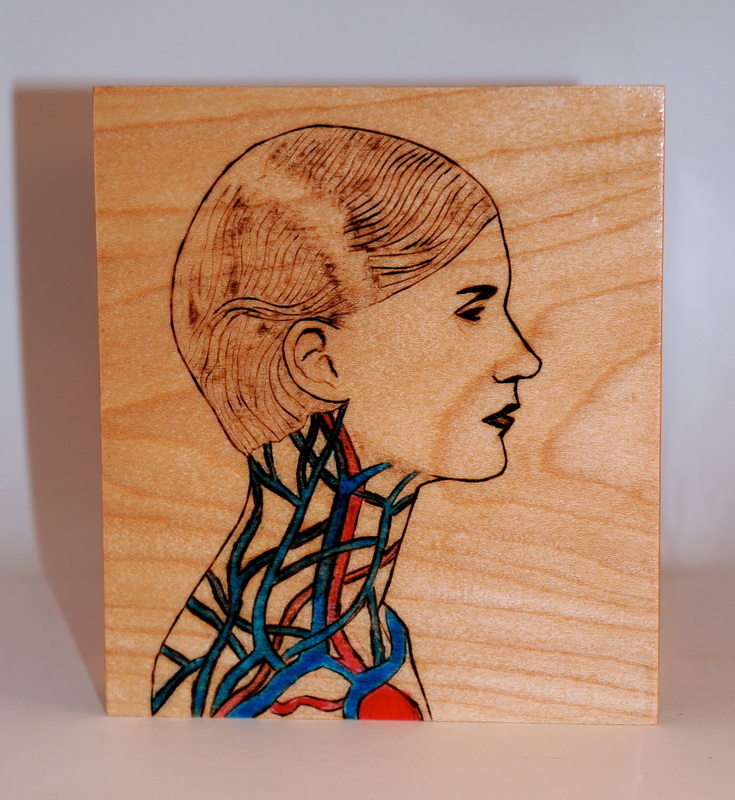 If you have a particular story or poem you love, contact us about making a box about it. All boxes are handmade and one-of-a-kind. 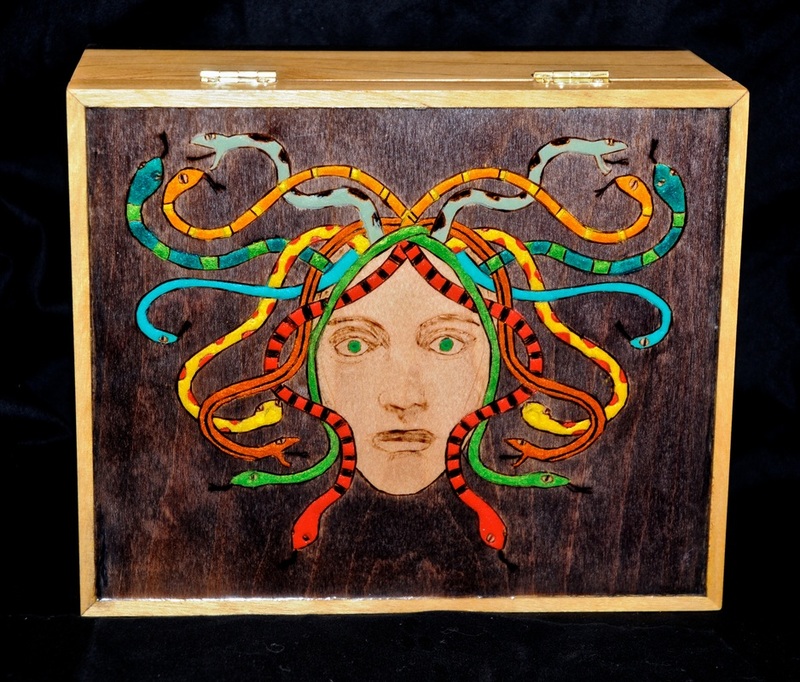 This box is handmade and is one-of-a-kind. We love fairy tales, and love to use the outside and inside of a box to try to tell an iconic story in two images. The top shows little red going into the dark woods at night, surrounded by bare trees. The inside shows a snarling, red-eyed wolf. The art is woodburned by hand onto maple and then painted and stained, and the sides are made of gorgeous red padauk wood with beautiful joinery. The hardware is ornate vintage brass hinges and matching front closure- a small lock would fit nicely into the clasp. 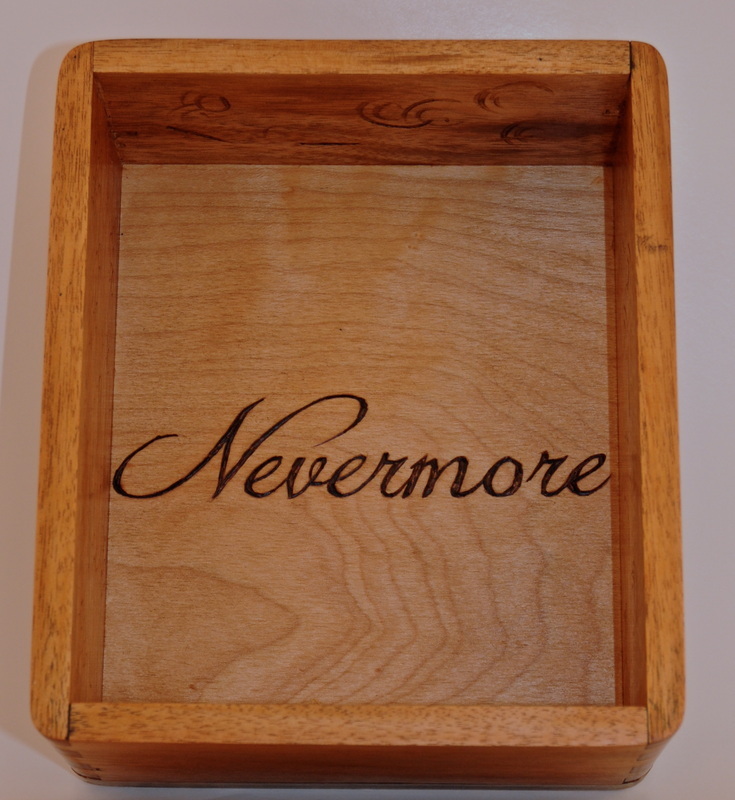 This is a unique box for any fairy tale lover! Oak sides, woodburned maple top and base. This box is handmade and one-of-a-kind. It is inspired by Edgar Allen Poe's poem "The Raven." 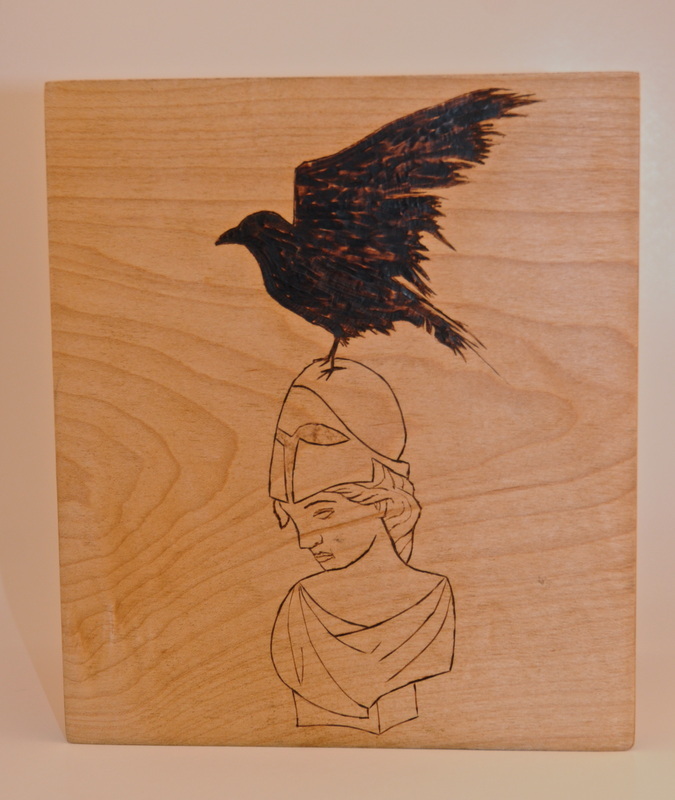 It has a woodburned raven on a bust of Pallas on the top, and "Nevermore" is woodburned inside in a gothic script. This is a truly unique box for a poetry lover! Woodburned and painted maple top and base, padauk sides with dovetail joinery. This box is handmade and is one-of-a- kind. 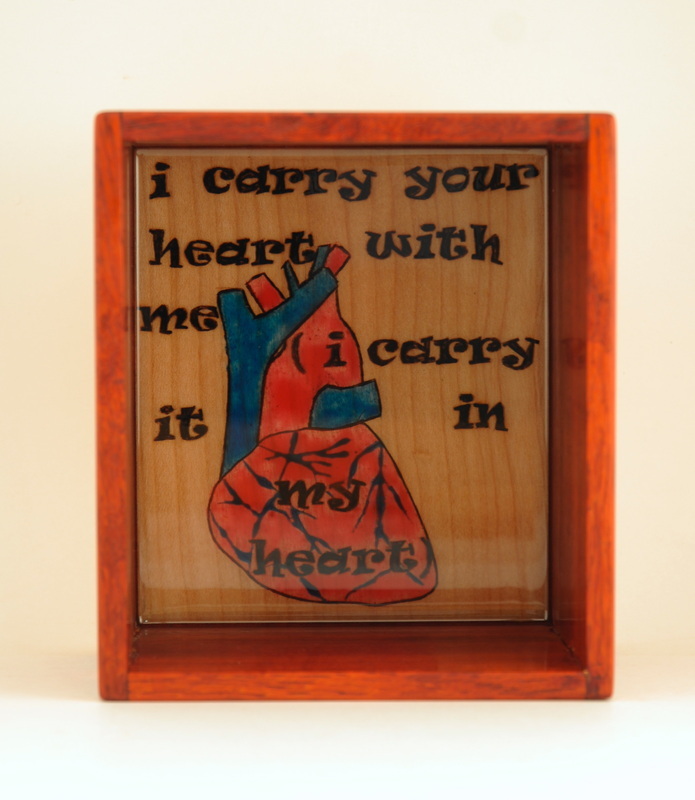 A poem box based on the wonderful romantic e e cummings poem "i carry your heart." Yes- I stole that face from a Man Ray photo- but I think my version is more interesting. The box contains a printed copy of the poem, which we can easily lacquer to the inside of the top at no extra charge. This is a wonderful unique gift for a poetry lover. This box is handmade and one-of-a-kind. The delicate grain and golden glow of the yellowheart wood picks up the yellow on the lid, and the red suede inside is buttery soft and complements the red snakes. This is a lovely unique box.